Brussel. The 23rd Belgian Pride gathered more than 100,000 people on the streets of Brussels on Saturday afternoon. Thursday, 17 May is the International Day Against Homophobia. Rainbow flags hang throughout the country, municipalities and stations, but not only for the 17th of May, but also for the Belgiam Pride week. 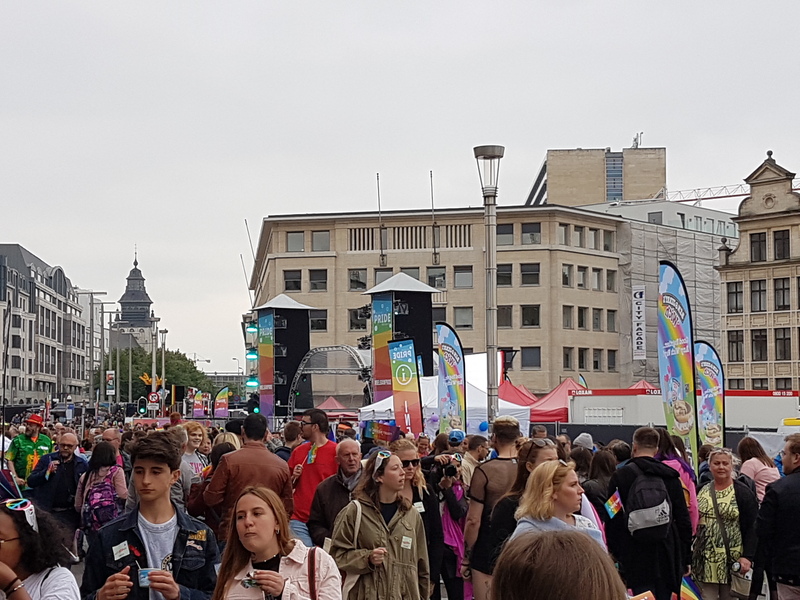 Belgium Pride 2018 is now well in sight with the Pride Village and the Gay Pride parade on Saturday , may 19. The Rainbow Festival at the Beurs/Bourse and Steenstraat-Kolenmarkt / Rue des Pierres / rue Marche aux Charbon) open on Friday to Sunday, with many activities. On Saturday at 12:00 the Pride Village is open in the Kunstberg / Mont des Arts with speeches and music. The parade starts at 13:00 and goes through the city center on a new route. This year, more than 70 delegations take part in the Pride Parade. The most important theme is tolerance. Two days ago the brutal murder from a young gay teen in the streets of Liège was commemorated ,..because he was gay. Also the many gay people who are attacked on the streets are too many. There are many 'gay'parties in the city and in Belgian cities arround Brussels.